High Stakes Poker is a cash game poker television program, which was broadcast by the cable television network GSN in the United States. The poker variant played on the show is no limit Texas hold 'em. It premiered on January 16, 2006 and ended on December 17, 2007 for the first 4 seasons and the last 3 seasons ran from March 1, 2009 to May 21, 2011 and was simulcast in 3DTV on N3D. The participants on the show include both professional poker players and amateur players. The show was hosted by AJ Benza in the first five seasons, alongside Gabe Kaplan. Starting with the sixth season, Kara Scott replaced Benza as Kaplan's co-host, with Scott conducting interviews from the poker room floor. Starting with the seventh season, Norm Macdonald replaced Gabe Kaplan as Scott's co-host. The first season of High Stakes Poker, taped at the Golden Nugget in Las Vegas, was first broadcast in January 16, 2006 at 9:00pm and consisted of 13 episodes until April 10, 2006, hosted by A. J. Benza and comedian/actor-turned-poker pro Gabe Kaplan. The second season, taped at The Palms and consisting of 16 episodes, premiered on June 5, 2006 and ended on September 18, 2006. The third season, consisting of 13 episodes, was taped at the South Point Casino at 9:00pm and premiered on January 15, 2007 at 9:00pm and ended on April 9, 2007. New players for the third season included Jamie Gold, Phil Ivey, Chris Ferguson, Patrik Antonius, Paul Wasicka, David Benyamine, Brian Townsend and others. Returning players from previous seasons included Doyle Brunson, Daniel Negreanu, Sammy Farha, Phil Laak, Jennifer Harman, Barry Greenstein, Erick Lindgren, Mike Matusow, Brad Booth and others. On April 2, 2007, GSN announced that High Stakes Poker would return for a fourth season, again taped at South Point. Taping was completed in May, with the season premiering on August 27, 2007 at 9:00pm. Returning players included Patrik Antonius, David Benyamine, Doyle Brunson, Eli Elezra, Sam Farha, Jamie Gold, Barry Greenstein, Phil Hellmuth Jr., Jennifer Harman, and Daniel Negreanu. Newcomers for the fourth season include Brandon Adams, Mike Baxter, Brian Brandon, Phil Galfond, Guy Laliberté, Bob Safai, Antonio Salorio, and Haralabos Voulgaris. The later episodes of this season featured a $500,000 minimum buy-in (compared to the regular $100,000 minimum) and these games saw more than $5 million in play on the table at one time. Season four finished airing on December 17, 2007 and featured 17 episodes. The network cited the show's strong ratings performance in younger demographics. Season five, which ran from March 1, 2009 to May 24, 2009 at 9:00pm, was taped at the Golden Nugget on December 19–21, 2008 and featured a minimum cash buy-in of $200,000. The format for season 5 differed slightly from its predecessors by having Kaplan and Benza not appear on camera until after the first commercial break in the show, rather than at the outset. Season six premiered at 8:00pm on February 14, 2010 and ended on May 9, 2010, with Gabe Kaplan and Kara Scott. It was taped for a second straight season at the Golden Nugget. The sixth season aired with three different groups of players throughout 13 episodes. Tom Dwan and Phil Ivey bought in for $500,000. Other rotating players, including newcomers Jason Mercier, Dennis Phillips, Andrew Robl, and Lex Veldhuis, bought in for $200,000. Season seven debuted on its new GSN Saturday night time slot at 8:00pm from February 26, 2011 to May 21, 2011, Norm Macdonald replaced Gabe Kaplan as the host and Kara Scott conducted interviews from the poker room floor. The series was filmed in December 2010 at the Bellagio in Las Vegas. Sponsored Full Tilt Poker pros were required to boycott the show this time around, as rival site PokerStars became its official sponsors. 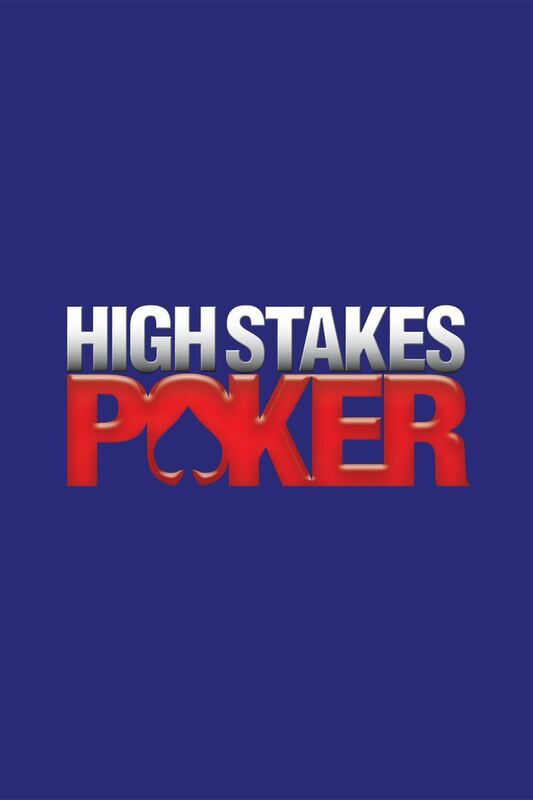 Thus, "High Stakes Poker" Season 7 is devoid of such Full Tilt pros as Phil Ivey, Jennifer Harman, Tom Dwan, Patrik Antonius, David Benyamine, Mike Matusow, and Eli Elezra. GSN later announced it would be scaling back its airings of High Stakes Poker after PokerStars pulled out of the U.S. market following the indictments in United States v. Scheinberg et al. crackdown on online gambling. When it first aired, High Stakes Poker was unique among televised poker series because it did not take place in a tournament setting. Instead, the program showed a high-stakes cash game. The minimum buy-in to the game is US$100,000, but players have bought in for as much as $1,000,000, such as Daniel Negreanu in Season 1 and Brad Booth in Season 3. For part of the fourth season, the minimum buy-in was $500,000. The first episode with the minimum $500,000 buy-in was broadcast on November 5, 2007. The minimum cash buy-in for the fifth season increased to $200,000 – the largest buy-in for an entire run of a television series. Unlike in poker tournaments, the chips involved represent real money. If a player loses his initial buy-in, that player may rebuy a minimum of $50,000. In addition, players may use cash instead of casino chips. Cash plays and stays as cash in the pot; it does not have to be converted into casino chips. Unlike tournament poker, blinds and antes are constant, instead of increasing as time goes on. High Stakes Poker has $300/$600 blinds with a $100 ante. The fourth season features three forced blinds of $300, $600 and $1,200, with a "straddle" or optional fourth blind of $2,400. The players include poker professionals along with amateurs such as Jerry Buss and Fred Chamanara. The show was created by executive producer Henry Orenstein. In season one, Daniel Negreanu confirmed in a post on his website's forums that all players were paid $1,250 per hour for taking part and that 13 episodes were edited down from 24 hours of actual play. 2006 WSOP Main Event Champion Jamie Gold commented that players were paid for participating, though they had to put much more money at risk to get to play the game. Gold also spoke about his interactions with other players, particularly Mike Matusow. The theme song for the show is titled "I'm All In", written and performed by John Pratt, Los Angeles. In Season 2, Gus Hansen won $575,700 with four fives, beating Daniel Negreanu's full house. Hansen raised to $2,100 with 5♦ 5♣, and Negreanu re-raised to $5,000 with 6♠ 6♥, which Hansen called. The pot was $11,700, and the flop came 9♣ 6♦ 5♥. Hansen checked his set of fives with a 4% chance of winning the hand and Negreanu bet $8,000 with his set of sixes and a 94% chance of winning. Hansen raised to $26,000 and Negreanu called, bringing the pot to $63,700. The turn came 5♠, making Hansen quad fives, leaving Negreanu a 2% underdog with his full house. Hansen bet $24,000, and Negreanu called, slow playing his full house. The pot was now $111,700. The river came 8♠. Hansen checked, and Negreanu bet $65,000. Hansen then went all in for his remaining $232,000, bringing the pot to $408,700. Negreanu called, and Hansen won the pot of $575,700. This was the largest pot before the $500,000 minimum buy-in game played during Season 4. In the November 12, 2007 episode of Season 4, Jamie Gold won $495,867 of a $743,800 pot that developed between Gold with three Kings on the turn card, and Patrik Antonius with a straight on the turn card. Antonius held A♠ J♦ and Gold had pocket K. After the 3♠ Q♦ 10♥ flop and K♥ turn, Antonius was a 4-to-1 favorite with his straight vs. Gold's three kings. Gold moved all-in and Antonius called. With such a large amount at stake, the players agreed to run the river (deal the river card) three times. The first river card, Q♥, and the second river run, 3♦, both paired the board to give two wins to Gold with a full house. The third river run, 8♠, kept Antonius' straight in front. As a result, Gold won $495,867 from the pot and Antonius won $247,933. Antonius' calm demeanor after the hand prompted host A.J. Benza to comment, "I'll tell you one thing: Patrik can take a punch. Imagine if that was Phil Hellmuth." In the November 26, 2007 episode of Season 4, Doyle Brunson won a $818,100 pot against Guy Laliberté. Brunson held A♦ 10♦ and Laliberté A♥ 5♥. The flop came A♣ J♠ 4♦ and the turn was 2♦. Brunson bet the turn, and Laliberte raised and Brunson moved all-in and was called. The players agreed to run the river twice. Brunson was a 75% favorite with his better kicker and flush draw, and he won both times to take the entire pot. After the hand, Brunson said, "When you don't make a pair for eight hours, you go crazy." Later in that same November 26, 2007 episode of Season 4, Patrik Antonius won $749,100 from a $998,800 pot that developed between Antonius with a pair of nines on the flop, and Sammy Farha with a king-high flush draw. Antonius went all-in after the flop and Farha called. The odds were roughly even, and the players agreed to run the turn and river four times. Antonius won three times to take three-quarters of the pot, $749,100, while Farha won $249,700. In Season 4, Guy Laliberté and David Benyamine created a pot of $1,227,900 — the largest in High Stakes Poker history — before negotiating a reduction of the pot to "only" $238,900. David had A♣ 8♣ and Laliberté had K♦ 5♦ and the flop came K♣ 3♦ 5♣ giving Laliberté top two pair and Benyamine the nut flush draw. Acting after Farha, Benyamine raised to $43,000 and Laliberté reraised to $168,000. Farha folded his A♥ 3♠, Benyamine went all-in, and Laliberté called, bringing the pot to $1,227,900. After turning the respective cards over, Laliberté, knowing he was the favorite, offered to run it once or twice. After further negotiation, Laliberté offered to take the pot previous to the raises of $238,900. Benyamine agreed. Antonio Esfandiari and a couple of other players wanted to see the turn and river, but Laliberté and Benyamine refused. In Season 4, a notable hand played out between Jamie Gold and Sam Farha, both for the eventual size of the pot and the manner in which the hand was played. Jamie Gold held K♠ K♥ and called the big blind, looking to trap. Farha, however, held A♠ A♦, and raised to $4,200. Gold called, still planning to hold back on revealing the strength of his hand. At the goading of Antonio Esfandiari, Farha offered to bet in the dark (before the flop was revealed) if Gold checked in the dark. Gold obliged and Farha bet $10,000. Gold told the dealer to not deal the flop yet, and raised in the dark to $30,000. Farha took several minutes, before stating his belief that Gold didn't have a good hand due to his antics and re-raised to $90,000. Gold's demeanor quickly changed, realizing that Farha probably had aces, but called anyway. The flop was finally dealt out 10♦ 6♠ 9♣, followed immediately by the turn of 4♣ since both players were betting the flop in the dark previously. Gold checked and asked Farha if he wanted to check it down (both players agreeing to not put in any more money), but Farha bet $100,000. Gold quickly called, insisting that he had a monster hand and that he knew Farha had aces. The river was 10♥, and Gold again checked. Farha prepared to bet again, likely putting Gold all-in, Gold repeatedly telling him to just check. Gold repeatedly stated that he had the best hand and that he checked because he didn't want to take more of Farha's money, but threatened to immediately call if Farha bet. After an extended back-and-forth, Gold continuing to insist that his hand could beat pocket aces, Farha checked, taking the pot of $391,300. Farha claimed that he knew his aces were the best hand but wanted to be nice to Gold. In Season 5, Tom Dwan won the biggest pot — $919,600 — to be played straight up (with no deals or multiple runs). Dwan won with three Queens, beating Barry Greenstein's two pair – Aces and Queens. Peter Eastgate was the original raiser with A♠ K♥, with Greenstein re-raising to $15,000 with A♦ A♣, Dwan calling with K♠ Q♠ and Eastgate calling behind him. The flop came 4♠ 2♠ Q♥, causing Dwan to bet on his pair of Queens and a King high flush draw, Eastgate to fold, Greenstein to raise with his pair of Aces and backdoor straight draw, Dwan to reraise, and finally Greenstein to push all-in, which Dwan quickly called. Greenstein had turned down Dwan's offer to run it twice on an earlier hand (in which Dwan had the best hand when they went all-in, though Greenstein ultimately won), and this time Greenstein again wanted to run it only once, but offered to take some of their money back, which Dwan turned down. At this point, it was almost an exactly even race. The turn was the Q♣, and the river the 7♦, so Dwan won the pot of $919,600. In Season 3, Brad Booth with 4♠ 2♠ executed a successful bluff against Phil Ivey, (then) leading with K♥ K♦, in a pot that stood at $31,100 pre-flop. The flop came 3♦ 7♠ 6♦; Ivey's overpair was a 79% favorite to Booth's inside straight draw and backdoor flush draw. After Ivey bet $23,000 on the flop to make the pot $54,100, Booth raised to $300,000. Ivey folded. At the beginning of Season 4, the players agreed that anyone who won a pot while holding the weakest possible hold 'em hand (2-7) would be paid $500 by every other player at the table. This led to several five-figure bluffs that were calculated to pick up the $3,500 bonus (and the respect of the table). Phil Hellmuth won the 7-2 bonus in the second televised hand of the season, making a $40,000 bet on the river that caused Mike Matusow to lay down pocket Kings. In Season 5, Tom Dwan executed a successful bluff against Barry Greenstein and Peter Eastgate in a pot that stood at $133,500 pre-bluff. Dwan won with a pair of tens against Barry Greenstein's higher pair of Aces and Peter Eastgate's (then) leading trip deuces. Greenstein, with A♥ A♣, opened the play under the gun to $2,500 and was quickly called by all players. Before the flop came out there was $21,400 in the pot and at this point, Dwan jokingly offered to chop the pot. The flop was 2♣ 10♦ 2♠. Eastgate, with trip deuces on his 2♦ 4♥, and Doyle Brunson with A♠ 9♣, both checked. Greenstein led out with $10,000 after some thought, and with seven people behind him, Dwan raised the pot to $37,300. David Benyamine (3♦ 3♣), Eli Elezra (J♦ 9♠), Ilari Sahamies (7♥ 6♠) and Daniel Negreanu (K♦ 4♦) all quickly folded. The action came back to Eastgate, who called, as did Greenstein. With the pot already at $133,500, the turn came a 7♦, and Eastgate and Greenstein quickly checked. After some thought, Dwan (a 95% underdog at this point) bet $104,200, causing Eastgate and Greenstein to reluctantly fold. Following the hand, Dwan was quick to announce he was bluffing by stating, "Peter had the best hand, I'll make a sidebet that Peter had the best hand." Doyle Brunson accepted, and eventually lost $9,000 when Peter, after a $1,000 bribe from Dwan, announced he had a trip deuces a few episodes later. After the hand was done, commentator Gabe Kaplan said that the only other person he knew who would have made a similar move was "Maybe the late Stu Ungar". In Season 6, Tom Dwan executed a successful bluff against Phil Ivey in a pot that stood at $408,700 pre-bluff. Tom Dwan (8♠ 9♠) raised $25,000 preflop and got called by Phil Ivey with (A♦ 6♦). After a flop of (10♦ Q♣ K♦), Dwan fired another $45,800 and Ivey called, making the pot $162,300. The turn came (3♠), and Dwan fired again, this time $123,200. Ivey again called with his flush and inside straight draws, creating a pot of $408,700. The river came (6♣), leaving Ivey with a small pair and Dwan with 9 high. Dwan bet another $268,200. Ivey considered calling for over 3 minutes (according to the TV show), but ultimately folded. In Season 7, amateur player Bill Klein opted to see the river in a $192,800 pot, by calling the re-raise to $67,000 by professional Phil Galfond of his $28,000 bet. Klein held 10♠ 6♠ for a flush draw, and Galfond, holding Q♠ 10♥, had a straight on a board that read J♠ 9♥ 2♠ K♣. The river card was the J♥, which prompted Klein to take a glance at Galfond from under his hat. "Looks like Klein's creative juices may be flowing", quipped commentator Norm Macdonald, as Klein slid a tower of 30 $5,000 chips forward equalling $150,000. After Galfond folded, Bill Klein showed the bluff and received a standing ovation and fist-bumps from around the table. In a single episode of Season 6, Daniel Negreanu lost a total of $380,000 in two hands, both to Mike Matusow. In the first hand, Negreanu went all-in on trip nines, holding (9♣ 8♣) on a (9♦ K♠ 9♥) board. Matusow, however, had flopped a full house since he held (K♦ K♣). In the second hand, Matusow went all-in on a flop of (6♥ 4♣ 7♣) holding (A♣ Q♣) for a flush draw. Negreanu called with pocket (10♥ 10♣). The players agreed to run the turn and river twice; Matusow completed the flush both times. These players have appeared in all seven seasons: Doyle Brunson, Antonio Esfandiari, Barry Greenstein, and Daniel Negreanu. Most every season included a key sponsor. Over the years, they included notable companies like PokerStars, Full Tilt Poker, and Bellagio.